A textbook designed for high school classrooms, Freedom’s Unfinished Revolution: An Inquiry into the Civil War and Reconstruction , examines one of the most contested periods in America’s history where social conflict and change shaped the national landscape for generations to come. Freedom’s Unfinished Revolution links the Civil War to the problems and promises of the Reconstruction era, providing a broader historical context to the racial injustice and social upheavals that followed. Filled with rich primary sources—letters, speeches, photographs, engravings, novel excerpts, among others—this textbook uses critical thinking exercises and supplementary resources to help students construct historical narratives. 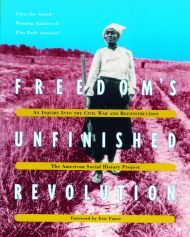 Freedom’s Unfinished Revolution was produced by ASHP/CML, written by William Friedheim with Ronald Jackson, and published by The New Press.